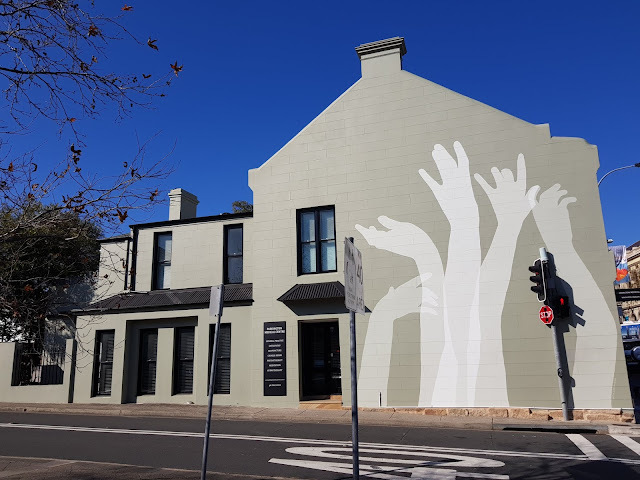 This mural appears on the side wall of a medical centre on the corner of Young Street and Oxford Street, in the inner city eastern suburb of Paddington. "Interwoven" was created in 2017 by artist Nastia Gladushchenko. I love your big mural, such strong graphics. I like this one, subtle and interesting. ...Jim. I have to give you a hand. Please give your opinion about My captures. That's a sizzling blue sky!